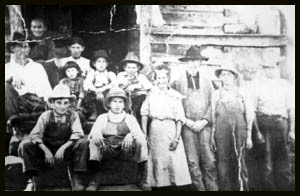 Margaret Sanders Parson, her son Cicero "Sickey" Parson bunch From left to right; back, Margaret Sanders Parson, in front of her; Sickey Parson and kids; Hazel, Cale and Lawrence Parson, front row is Floyd Parnell, Carl Parson, Maudie Parson (daughter of Sickey), Mr. Robertson (father in law of Sickey) His wife is seated in back behind Hazel. The next two in front on right are Jess Parnell and ?. I was told one of them is Jess, I think it is the one next to the end with the overalls on. Margaret is my grandmother, Maude Parson Sanders' mother. 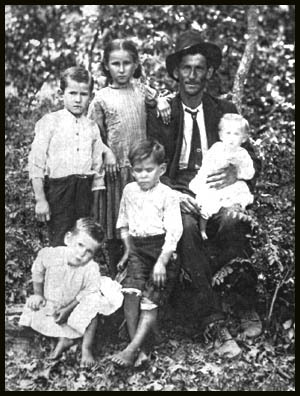 Cicero "Sickey Parson and kids Carl, Maudie, Sickey, Cale, Lawrence and baby Hazel Parson. 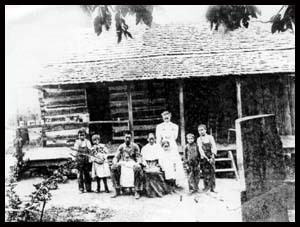 Cicero "Sickey Parson is my grandmother, Maude Parson Sanders' brother.